Licensed Groot Big Face BackpackHow can you resist the adorable Groot?Now you can carry his face with you wherever you go!Features:-Large black and embroidered eyes-A stretched vinyl smile-Printed brown and green pattern reflecting layered bark and a fine coat of healthy foliage-Topped with leafy sprouts to further reflect fake foliage-Measures: 13? X 17? X 5.25?-Sports a spacious main compartment sealed and accessed by zipper-A smaller compartment residing under Groot's welcoming smile-Secondary padded Laptop Zipper Pocket (Fits up to a 15? 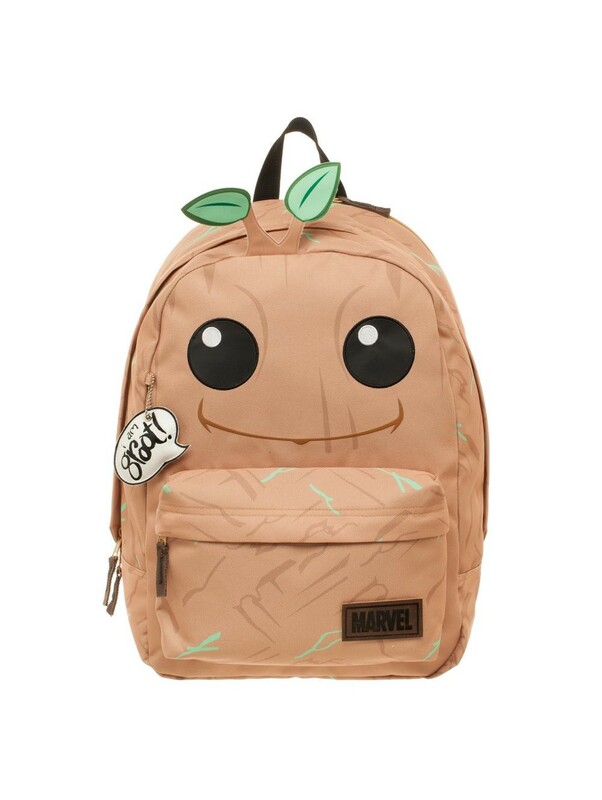 laptop)-2 padded, adjustable straps for comfortable carrying-A giant "MARVEL" badge stitched to the backpack-Made from 100% polyesterGroot backpack cleverly reproduces the familiar, friendly features of the Guardians' stalwart Tree-person, Groot!